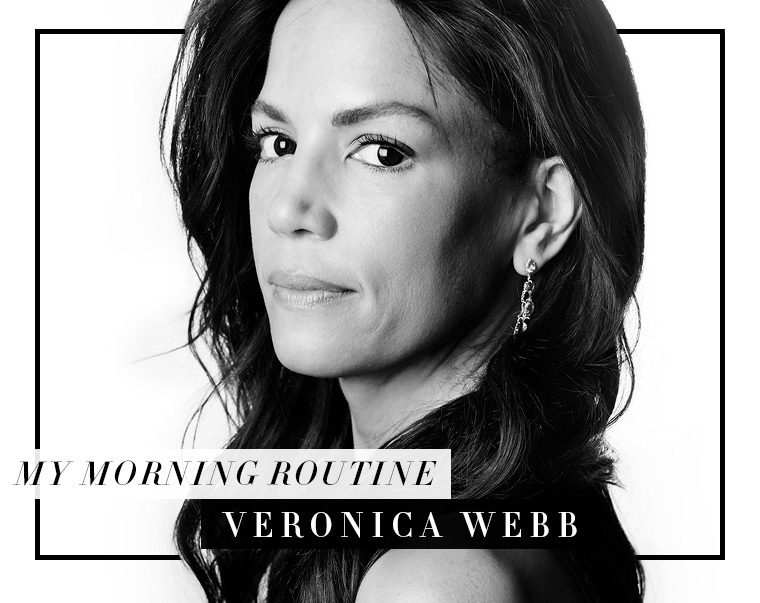 Welcome to My Morning Routine, where Veronica Webb and other good-life gurus share their personal (frequently surprising, often healthy) morning rituals—to help you make your a.m.’s more awesome. Supermodel, actress, writer, television personality, and Tory Sport athlete. 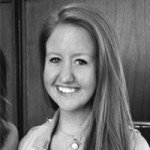 Webb is currently training for the Hamptons Half Marathon on October 1, in honor of the Tory Burch Foundation. I wake up every day at 6:15am—without an alarm. Even on the weekend, I’m up by 7 a.m. I’ve always been a morning person, but deep down, I’m jealous of night owls. The first thing I do after I wake up is drink a glass of water, which also happens to be the last thing I do before I go to sleep. It helps the body flush out toxins and get organized. Before I even get out of bed, I stretch—it’s a cardinal rule. I do a figure four or happy baby pose to stretch my back. I really believe that muscular tension shows on your face—and in your attitude towards life—so I try to get rid of that ASAP. I usually like to workout first thing in the morning. One of the things I’ve learned over the years—and something that all supermodels will tell you—is that exercise is really your best beauty trick. I love to have my workout finished before anything else pops up during the day, and running in the morning is so quiet and peaceful. Plus, exercise—like coffee—makes me a nicer person. As I train for this half marathon I find that while I’m working out less frequently, my workouts are a lot harder and require a longer recovery period in between my runs. Before I was training, my workouts were more focused on body weight, cardio, or were barre classes—I’d basically work out until my strength failed me. Now that I’m running so much, I find that I need a lot more recovery time. As soon as I’m done with a long run, I take a bath in Epsom salt. I’ve also added magnesium glycinate complex to my supplement routine and I drink Focused Zone from Amino Vital—it’s a branched-chain amino acid that assists with quicker recovery. Once I’m back from my run and get out of the bath, I’ll have breakfast. I make sure that the first thing I eat every morning is raw—whether it’s juice, fruit, or a smoothie—because I don’t want to shock my system awake. For breakfast, I eat—in this order—water, fruit, a cup of Bulletproof coffee, and McCann’s Irish Oatmeal that I make the night before. I prefer Bulletproof coffee to regular coffee for so many reasons—it doesn’t give me that coffee crash, but I still have so much energy, it keeps me fuller longer, and it has less toxins. Instead of adding milk, I add a pat of grass fed butter and medium chain triglycerides that are derived from coconut oil. After I have something in my system, I’ll take all of my vitamins and supplements. I always take calcium, omega-3, B12, and TA-65, which specifically targets your telomeres. Telomeres wrap around the strands of your DNA, and a frayed telomere causes aging and affects organ function and cognition. Think of a telomere fraying as sort of like a sweater that starts to tear apart the older it gets—I’m all about protecting them. My beauty routine in the morning is pretty simple when I’m not working or on set. I splash my face with cold water and, if it feels dirty or dry, I’ll use a gentle scrub with coconut oil—the lipids in coconut oil actually mimic the lipids that our skin naturally produces, more closely than the oils used in most cosmetics. The scrub I use and like is Bogavia, which is made with sugar and coconut oil. Also, a major game changer is that I always wear sunscreen on my neck, face and hands—365 days a year. I also take a few minutes when I’m getting ready to read fashion news and all of the headlines in the health, tech, and fashion sections of The New York Times on my phone—I like to stay on top of everything. Of course, this is my morning routine in a perfect world. No matter how disciplined I try to be, I am married and have four kids, and I work as a freelancer—so every day is unpredictable. Sometimes what I want to accomplish by 7 a.m. doesn’t get accomplished until midnight, but a girl can dream! Training for a race this fall, too? Here are seven genius tips to help you become a better runner. And you’re already working your body and mind, but what about your face? This workout is designed with that in mind.